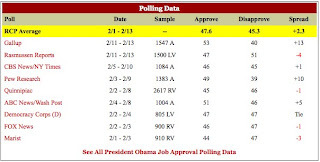 The Rasmussen Poll shows Obama's approval-disapproval rates at 47-51, a difference of -4. The Gallup Poll shows Obama's approval-disapproval rates at 53-40, a difference of +13. 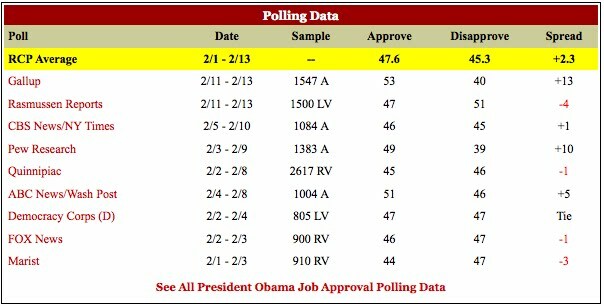 That's a 17-point swing in approval/disapproval for two polls, both taken over the same 3-day period (11 February - 13 February), with similar sample sized (1,547 for Gallup, 1,500 for Rasmussen). Now, does this mean that either Gallup or Rasmussen are a bunch of liars? No. Well, maybe. The Gallup poll is of all Americans, while the Rasmussen poll is of likely voters. Which supports my belief that people who don't know what's going on are more likely to support a president who doesn't know what's going on. And Americans who care about this country (likely voters) don't think so much of a president who doesn't care about this country.